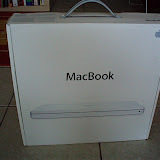 I've always wanted to try out a mac, and the recent batch of Intel Core 2 Duo macbooks really caught my eye. However, I managed to resist the temptation last year ... as my wife Hayfa kept reminding me, we didn't need more computers cluttering up the house (we already have a dell laptop and an AMD64 desktop that I built in the UK). Anyway, recently I moved to a new job (working on OSGi stuff) and this triggered a new bout of window ...err... mac-browsing. I'd been looking at the 2GHz mid-range model, but it wasn't in stock in KL. Then one weekend when Hayfa was in Penang (funny how I buy these things when my sayang isn't around) I saw an advert for MacCity in Cineleisure - RM3999 for the basic model for the first 10 customers between 3 and 5pm, a saving of RM400! So I drove to Cineleisure, parked, wandered over to the store just before 3pm, mulled things over a bit, decided to queue and got the next-to-last one! I'm very happy with my macbook - didn't take long to get used to the single mouse button (even starts to make sense!) and the mac command key. Even happier once I got fink and iTerm installed - in fact, it's now replaced my development machine at work! OSGi? I didn't know anyone working on OSGi in Malaysia. May I know who's involved? We're part of the Jayway software house and work on all things OSGi, for example OPS4J. Among others, I work with Niclas Hedhman who is a member of the JSR 291 (OSGi R4.1) expert group.